Yes! Our recurring event feature is perfect if you have an event that happens every week or month like a book club, poker night, softball game, and much more. When you create a recurring event on Punchbowl, you can set up your schedule and we'll create and send each invitation for you. To make an event recurring, first, create and save your invitation. 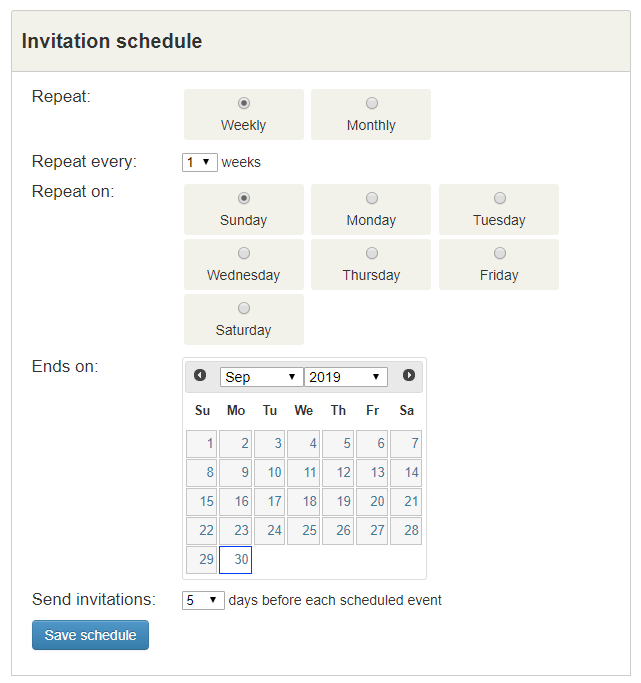 Then go to the Invitation Options page, find the Recurring Events option in the Member Features tab, and click the Add Schedule button. On the next screen, you'll be able to set how often to send a new invitation, which day the additional events will take place, and even set how long before the event you want to send the invitations out. You will receive an email from Punchbowl before the invites go out so as well you can make any necessary changes. To set up a recurring event through the mobile app, tap on the Invitation Options button and then the Show button for the Member Features tab. Next, tap on the Add Schedule button for the Recurring Events option.